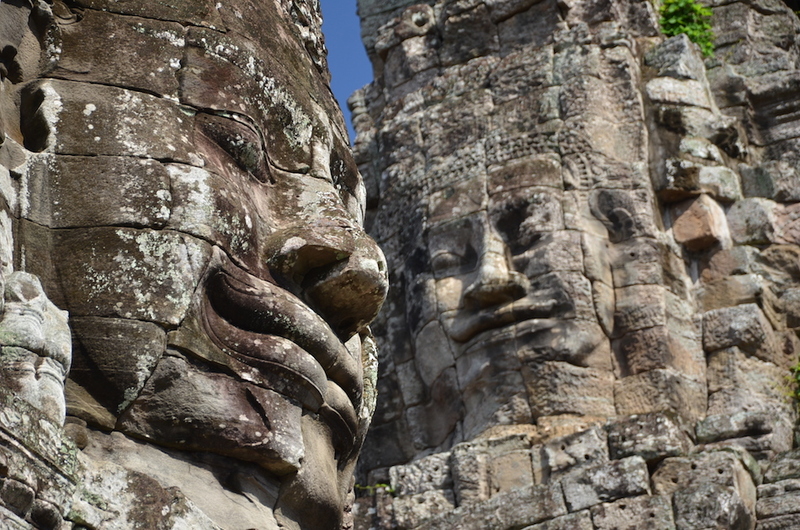 Cambodia is a country that has suffered greatly, and still the people wear warm welcoming smiles. 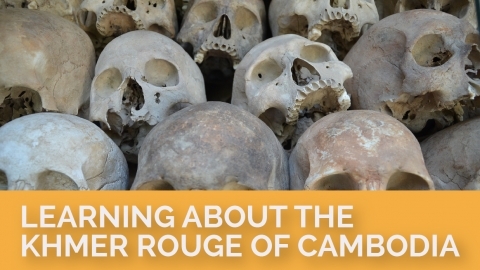 The genocide perpetrated by Pol Pot and the Khmer Rouge almost completely devastated the Khmer people and culture, but still they are here, and rebuilding their lives. I can’t help but feel humbled while in the country and constantly reminded of how much I really have to be grateful for. The beauty of returning to a country a 2nd time is that you are familiar with your surroundings and it feels a little more like home, especially if you enjoyed yourself the first time around. 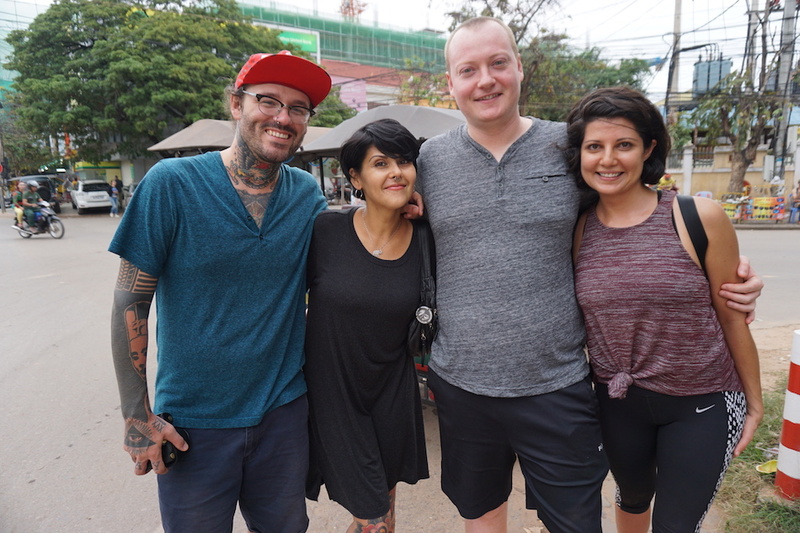 Cody and I had 2 weeks in the country formerly known as Kampuchea, which was more than enough time to relax, eat some great food, meet new friends, and catch up with old ones. 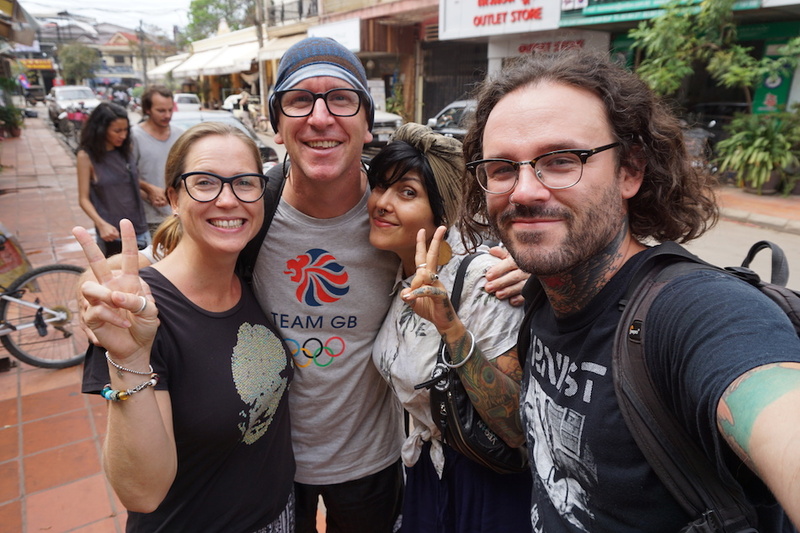 We landed in Siem Reap at 7:30am excited for our visit with Caryl and Paul of Vegan Food Quest. Immediately we spotted a man holding a sign reading ‘Giselle and Cody’, he introduced himself as Narong, and led us to his tuk tuk where he serenaded us all the way to our vegan Air BnB. Pulling up to the apartment, we were greeted by Caryl and Paul’s big smiles followed by bigger hugs. This was our first time meeting the couple, but it felt like we were reuniting after many get togethers. 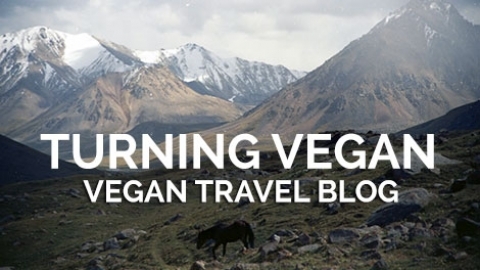 We sat and chatted for hours, and were served a lovely breakfast of fresh baked bread, tofu scramble, eggplant bacon, and good coffee. 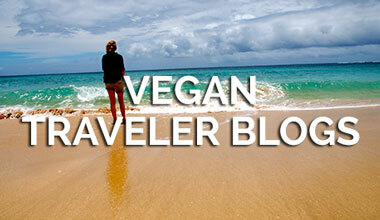 After settling into our comfortable room and having a rest, Paul and Caryl led us on a vegan food crawl of Siem Reap. 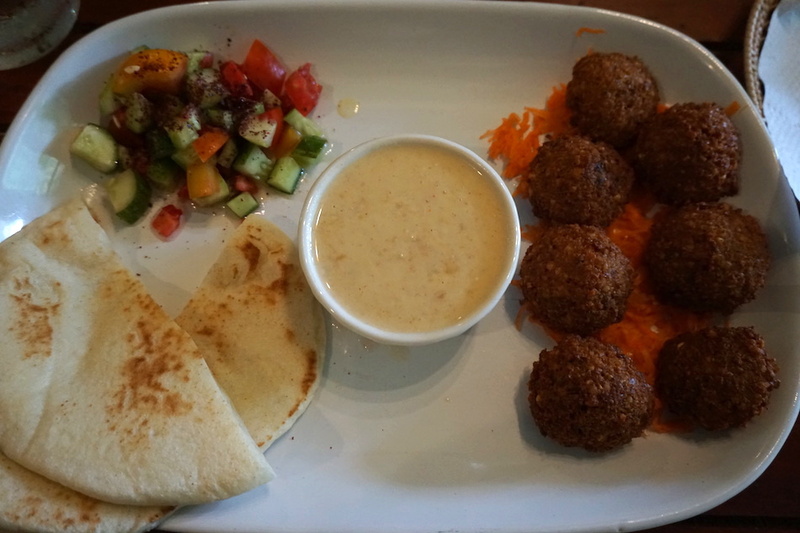 Our first stop was Atmosphere, an omni Middle Eastern restaurant owned by a very friendly man named Mo. 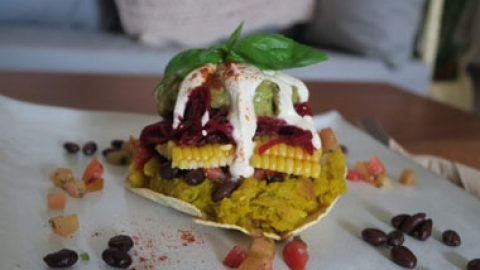 We dined on a falafel platter, coconut creamed curry eggplant with steamed rice, and his amazing dish aptly named ‘Ask Mo’, an incredibly flavourful dish of soft cubed slices of pita, smothered in a saucy lentil stew, with onions, and spices. Wow. Cody and I returned the next day for more. We carried on eating into the evening, and also met another night for dinner and drinks, and then breakfast the next day. All of the food was great, and we couldn’t have asked for better company. While walking around town with the Vegan Food Quest team, we bumped into one of my oldest friend’s sisters and her partner. We were all in shock! 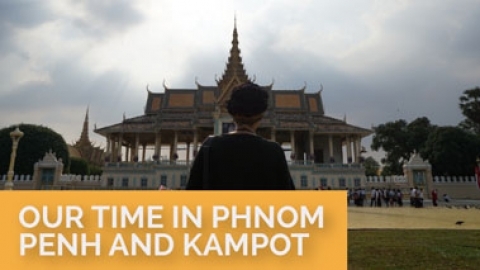 What are the chances of bumping into each other all the way in Cambodia? 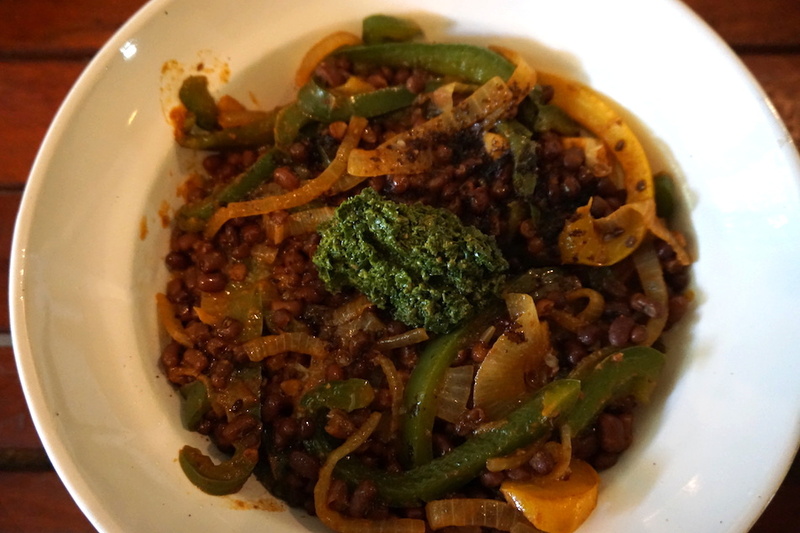 We made plans to have dinner and catch up at La Pasta, a fantastic Italian restaurant that has a separate vegan menu. It was so nice to catch up, and even nicer to see familiar faces from home. The vegan pizza and homemade pasta with mushroom bacon, and a few glasses of red wine was also a nice treat. 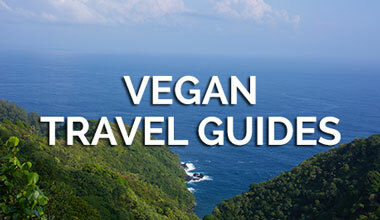 During time on our own, Cody and I went on the hunt for vegan food and it was everywhere. 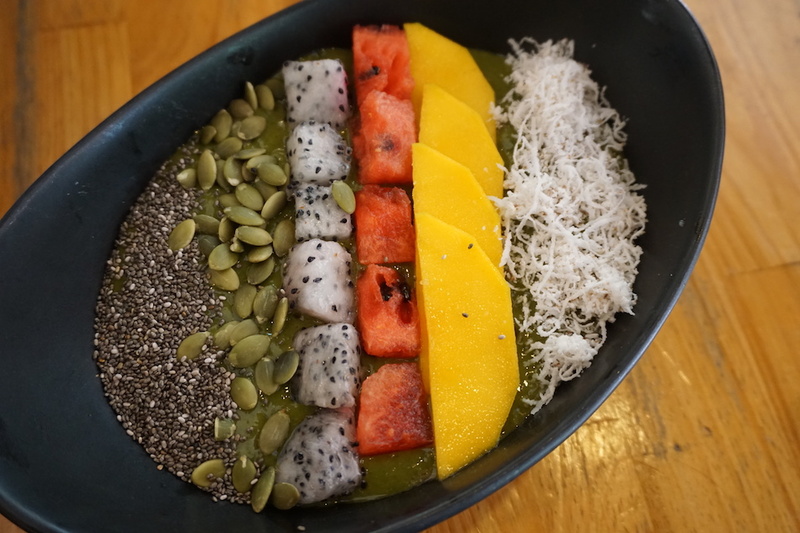 We enjoyed a nice matcha smoothie bowl with fresh fruit at Sister Srey. Like many restaurants in town, Sister Srey is a social enterprise that aims to have a positive sustainable impact on the local community, as well as help young Khmer students. 20% of profits (plus donations) go towards supporting individuals through health, education, hygiene, and supporting rural families. 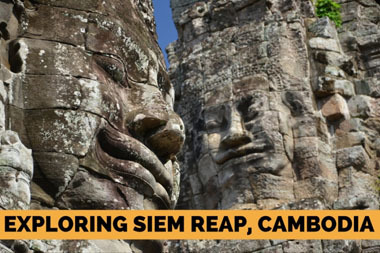 Over 40 members of Siem Reaps hospitality and tourism industries have launched RNL aiming to revolutionize the way water is consumed by tourists in Cambodia. Tourists can purchase reusable aluminum bottles for refill at participating venues across the city, with the goal being to minimize the amount of plastic waste produced in the kingdom. 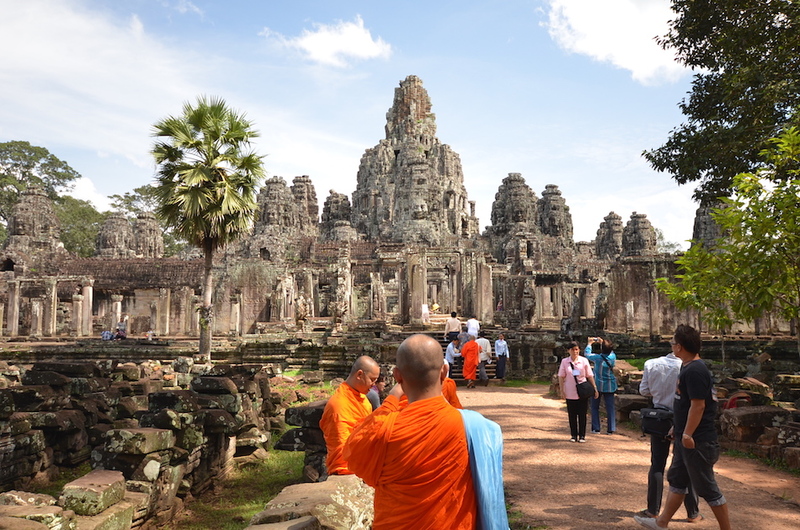 In 2015, 4,775,231 million visitors travelled to Cambodia, staying an average of 6.8 days each. 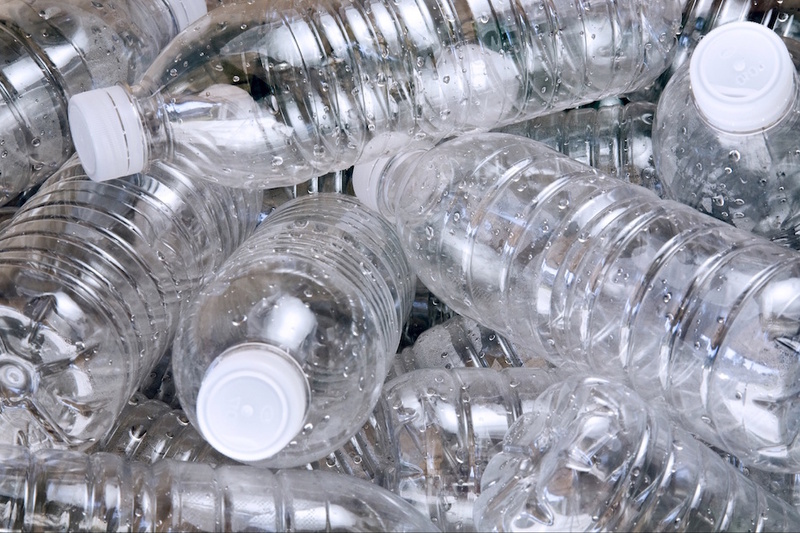 During that time, these visitors consume an average of two litres of water per day, many from half-litre or litre bottles which means they have the potential to generate, on average, 130 million plastic half-litre bottles every year. 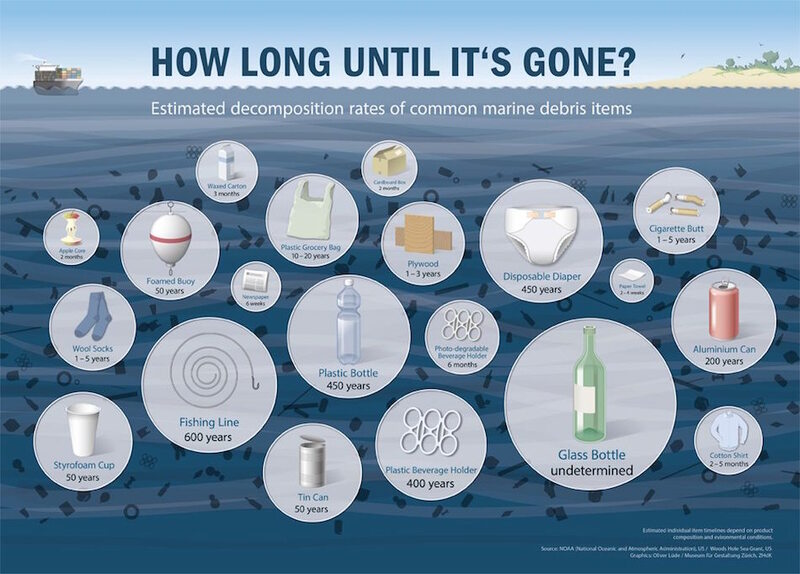 That is more than 10 million bottles per month, or 355,000 bottles per day, equivalent to 26 Olympic swimming pools filled to the brim with plastic bottles every single year, year after year. 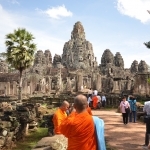 And that number can only grow as the number of tourists to Cambodia is projected to continue rising. 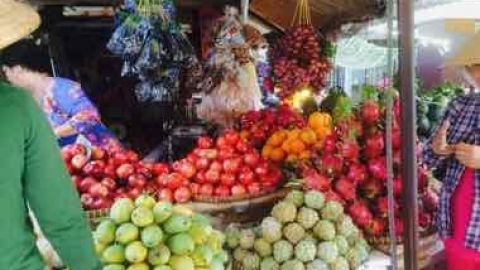 Plastic is one of the biggest problems that plagues our planet. It destroys wildlife, ends up in the oceans killing marine animals, and gets discarded and blown all over the world along roadsides, in forests, fields, and gardens. This is a wonderful campaign to support, as well as reminding ourselves daily to bring re-usable bags and tupperware to the market, and even asking for no straws in our drinks. Every bit helps. 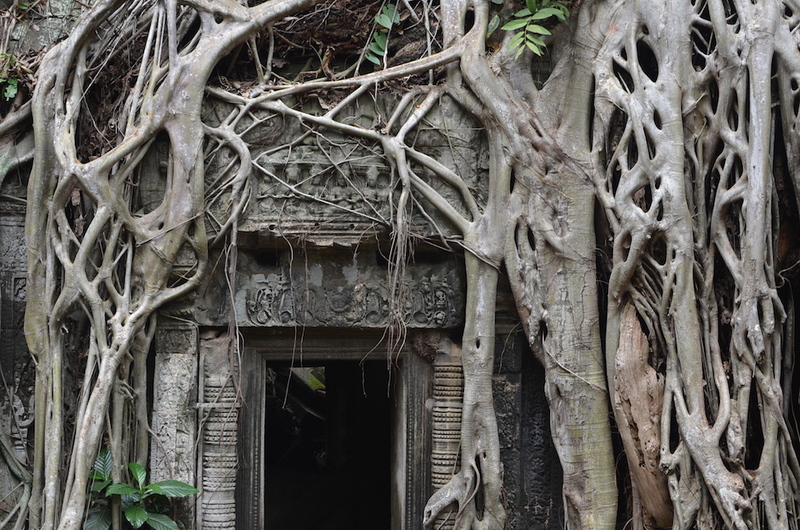 Cody and I had already visited Angkor Wat during our first visit to Cambodia, and we had planned to go a 2nd time around, but we changed our minds last minute. 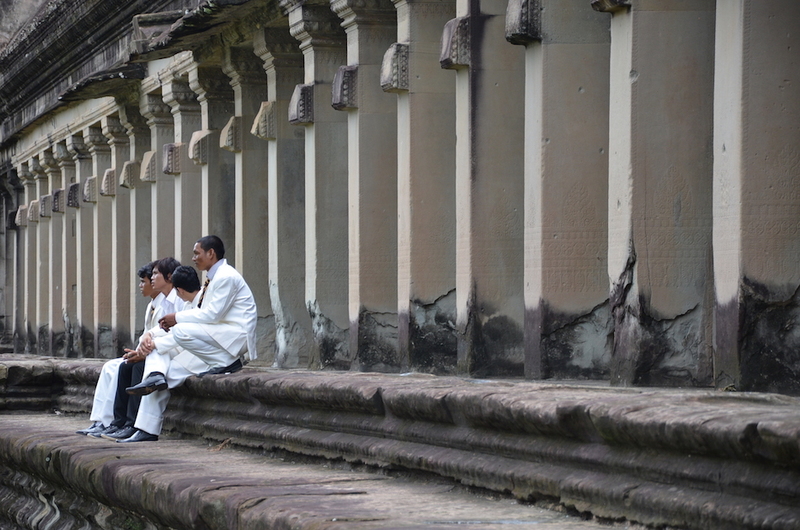 The temple of Angkor Wat is a powerful symbol of Cambodia, and is a source of great national pride. The temple complex is the largest religious monument in the world, measuring at 402 acres. 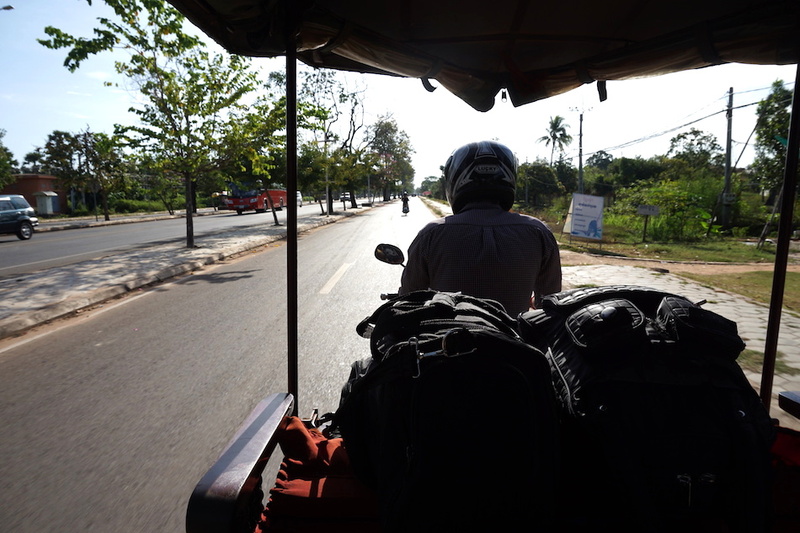 You can hire a tuk tuk driver for $12-$15 to take you around for the day. Do not miss visiting this incredible complex. 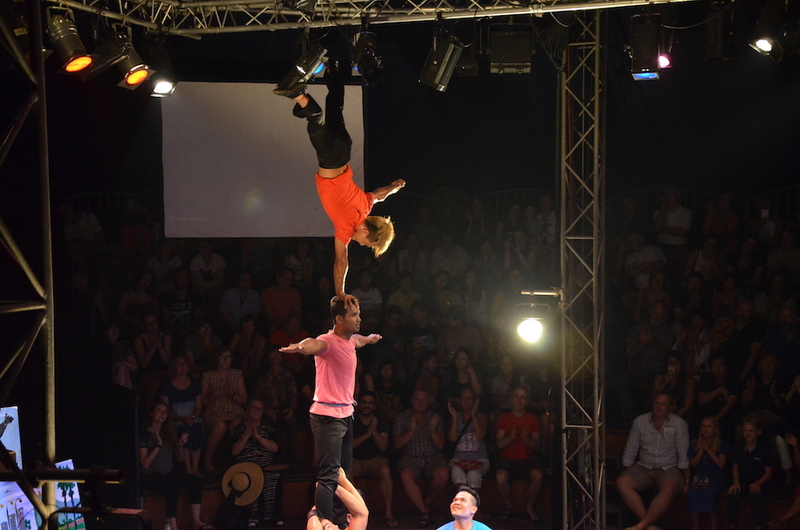 On our last evening in Siem Reap we were treated to a wonderful human circus show called ‘Phare’. In 1994, after the fall of the Khmer Rouge, 9 Cambodian men taking art classes at a refugee camp discovered that art was a powerful tool for healing, and so they began offering free drawing classes to street children. Soon after they opened a school (PPSA), eventually offering professional arts training (including music, dance, and circus) and K-12 education. 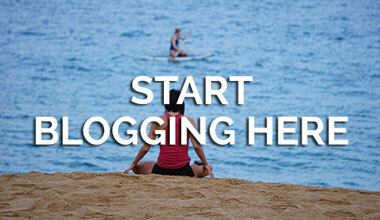 Today more than 1,200 pupils attend, and all programs are offered free of charge. Phare artists are graduates of Phare Ponleu Selpak, in Battambang, Cambodia. 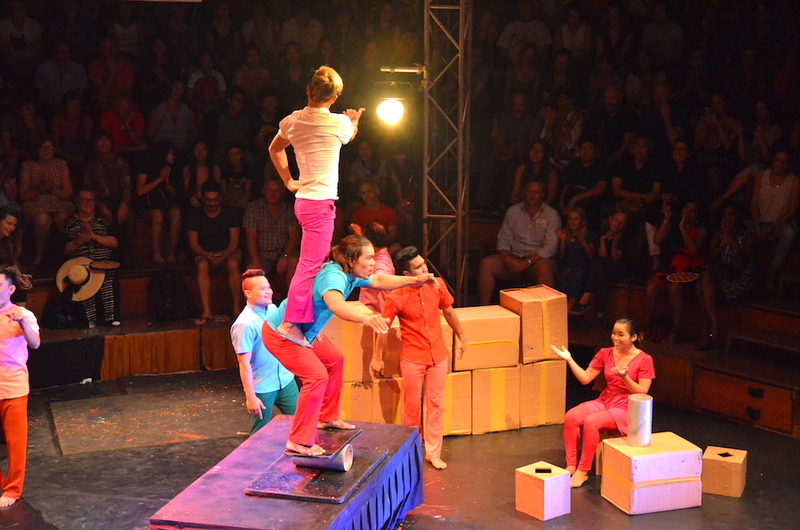 The show that night was based on the true life stories of the founders of Phare Ponleau Selpak NGO School. It told the story of a child named Sokha, haunted by war. The Khmer Rouge visits her in her dreams creating a dark and distorted reality, but she discovers strength and healing through art. 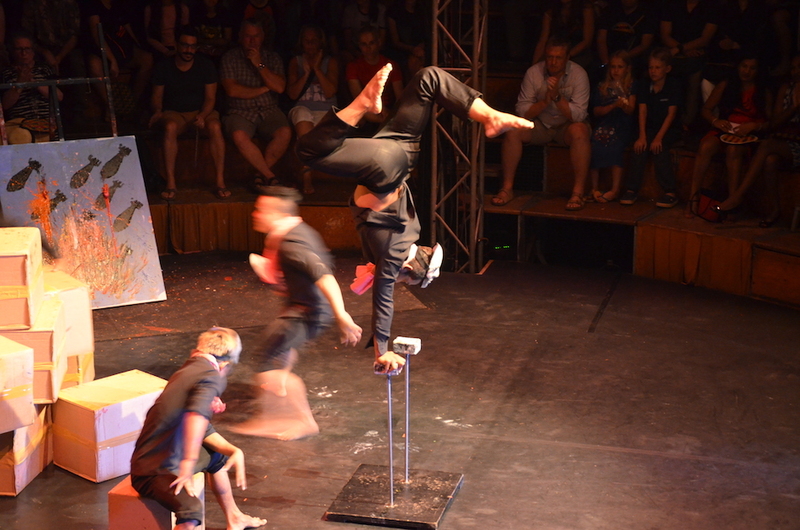 The show was incredibly powerful and touching, showcasing a mix of contemporary circus techniques, live painting, dance, drama, and fantastic live Cambodian folk music. It also highlighted the long term effects suffered by post-war victims and how much art is helping to heal and rebuild the country. 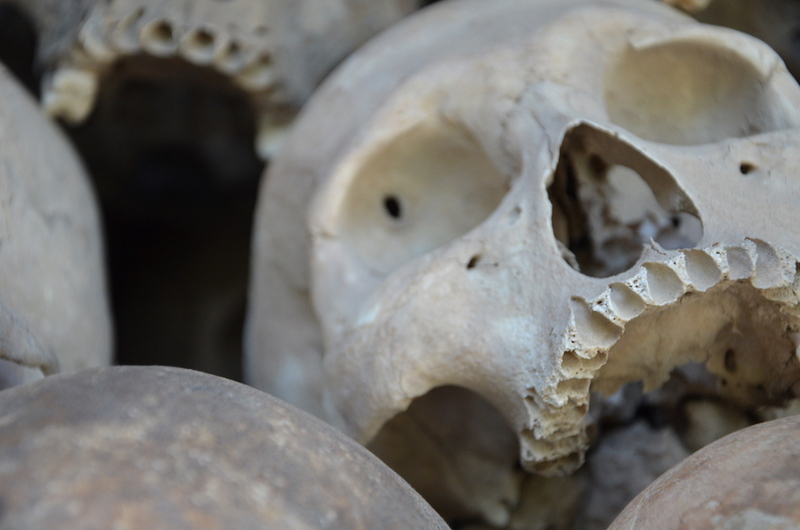 Apart from visiting Angkor Wat, the Killing Fields, and Tuol Sleng, PHARE is a must do during your time in Siem Reap. 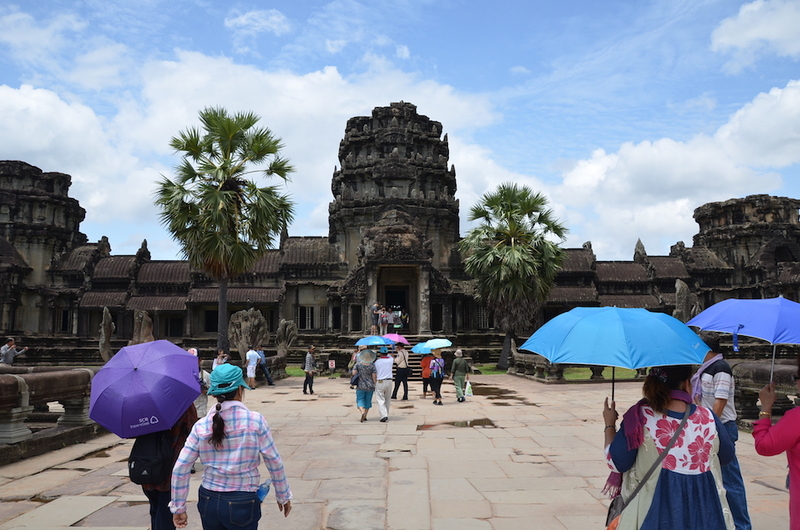 It was the highlight of our 2nd time in Cambodia and easily one of the top things we did in the past 6 months. 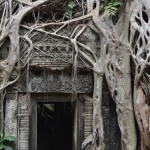 There are several other wonderful places to visit in Cambodia-like Kep, Kampot, Battambang, and Koh Kong, but Siem Reap is a good place to start your journey in this beautiful country.